Israeli soldiers injured, Friday, dozens of Palestinians holding a nonviolent protest in Ras Karkar village, west of Ramallah, in central West Bank. Dozens of Palestinians marched in the village, and headed towards their lands threatened with further illegal annexation for the construction and expansion of Israel’s’ illegal colonies. The protesters held noon prayers on their lands, while dozens of soldiers surrounded the entire area, and demanded the Palestinians to leave. 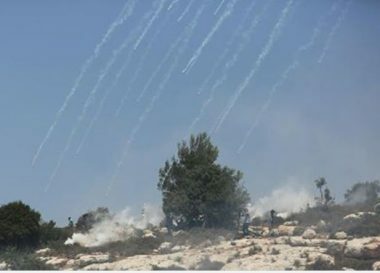 The soldiers, especially those stationed on the ar-Reesan mountain, which overlooks Ras Karkar, Kafr Ni’ma and Kharbatha Bani Harith, fired many gas bombs and concussion grenades, in addition to rubber-coated steel bullets at the Palestinians. Medical sources said five Palestinians were shot with rubber-coated steel bullets, and dozens suffered the effects of teargas inhalation.